In this 15-minute quick start, you'll use the Zendesk Apps framework to access ticket data. You'll also use the framework to add a comment to a ticket as well as create a ticket. 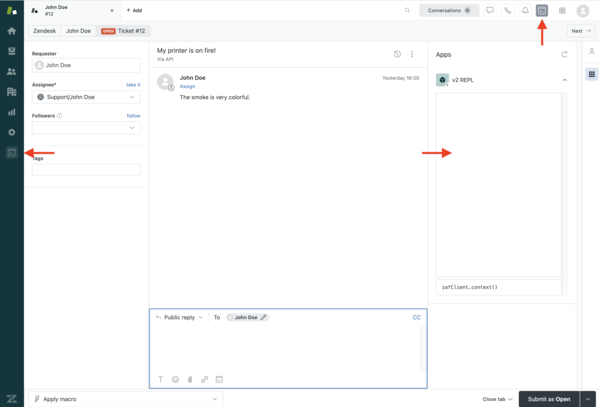 A Zendesk app is simply a small HTML application installed in the agent interface that extends the product's functionality in some way. 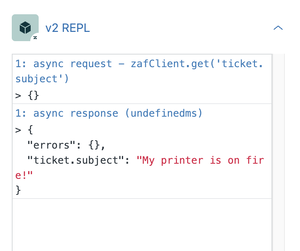 Note: REPL is not supported in Zendesk Chat. If you don't already have a Zendesk Support account, register to start a free trial at https://www.zendesk.com/register/. 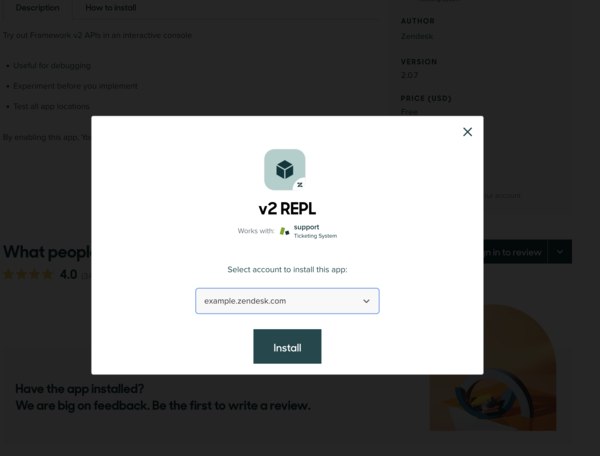 In your browser, navigate to the REPL v2 app in the Zendesk Apps Marketplace at https://www.zendesk.com/apps/support/v2-repl/. The app is installed in several places in the agent interface -- the nav bar on the left, the top bar, and the sidebar of the Ticket, New Ticket, User, and Organization pages. The Apps framework has lots of APIs that give apps access to all kinds of data in your Support or Chat accounts. Use the framework's get() method in your apps to retrieve the data. Let's get data from a ticket that's open in the agent interface. Open any ticket in the agent interface. The response tells you there were no errors and that the ticket subject is "My printer is on fire!". The data you can access depends on the location of your app in the agent interface -- nav bar, top bar, or page sidebars. 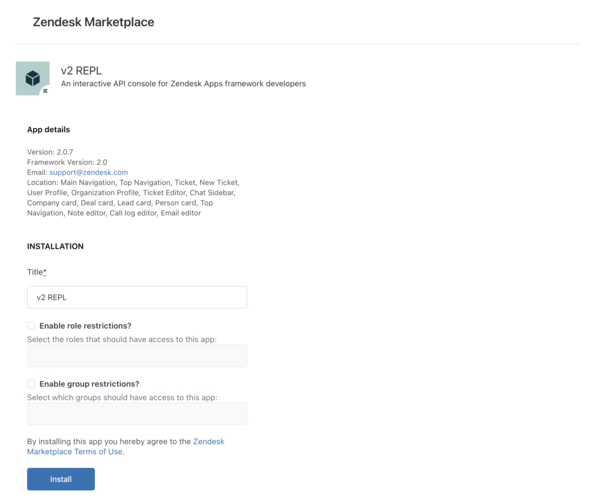 For a full reference of the data you can access in each location, see Zendesk Support API in the Apps documentation. Use the framework's invoke() method in your apps to use actions. Let's add a comment to a ticket. Open a ticket in your agent interface. Like data, the actions you can invoke depend on the location of your app in the agent interface -- nav bar, top bar, or page sidebars. See the API docs for details. 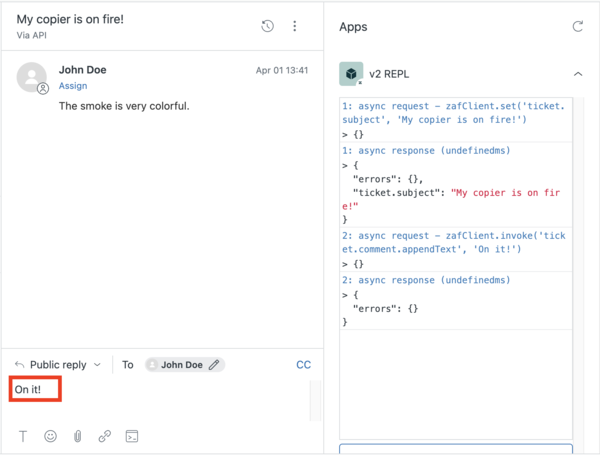 The request() method not only simplifies using the Zendesk API, it eliminates the cross-domain headaches associated with making external API requests from a browser. Tip: You can also make server-side HTTP requests with technologies like Python, Ruby, or PHP, but that's a subject for another day. 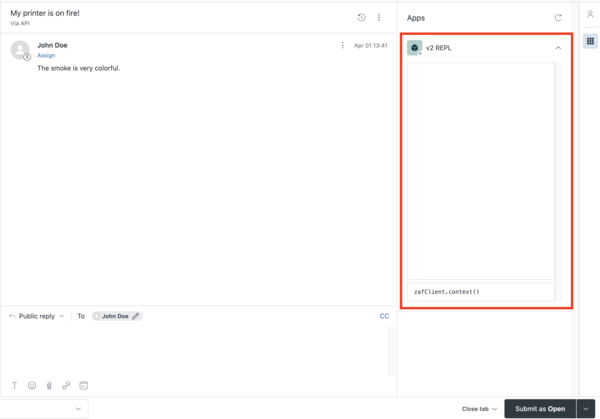 Let's use the Zendesk REST API to create a ticket from an app. 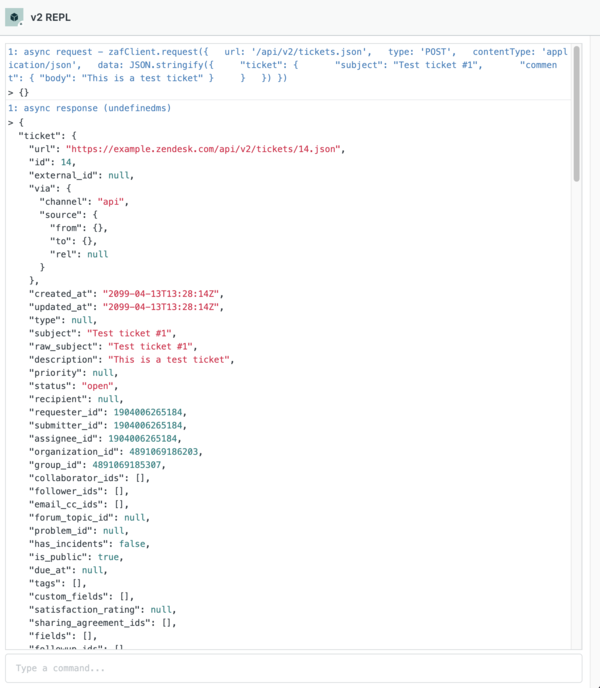 To create a ticket, you make a POST request to the /api/v2/tickets.json endpoint. You can find all the details about the Tickets API in the developer docs, but for now let's just dive in. Open the REPL app in any location. To clean up after yourself, delete the test ticket by selecting it in the list, clicking the Edit Tickets button in the upper-right, and selecting Delete. 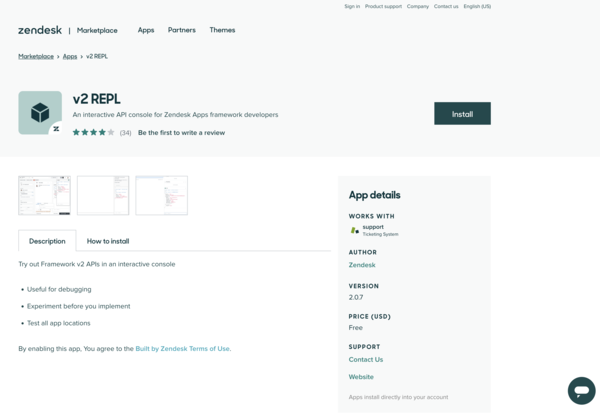 Ask questions or look for answers in the Zendesk Apps developer community. The only code it will let me run is zafClient.context() - the default option. Can you help with this? Hi Aaron, make sure you're running the REPL app from a ticket page, not a user or org page. The "ticket.subject" only works with a ticket open. 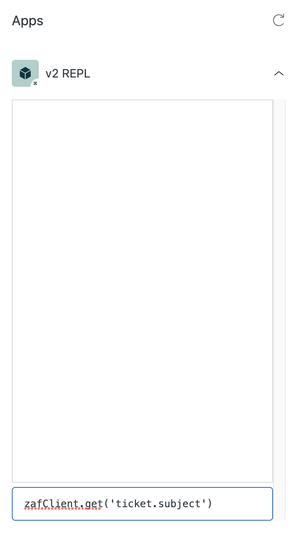 @Charles I am on a ticket page- I've tried it with multiple different tickets. It must be another issue. Do you have any advice? Thanks! Have the same issue as Aaron here. > APIUnavailable: "ticket.subject" Could not find handler for: "ticket.subject"
The embedded location of each REPL V2 console determines what data can be accessed, not just the URL of the page. The interpreter that should be used with the request, zafClient.get(ticket.subject'), is located in the Ticket's Apps sidebar, not the top bar dropdown found next to an agent's profile picture. The REPL app puts a console in every location an app can be placed - these consoles are not all created equally. Each comes with differing access to your Zendesk dataset.